When pilot examiner Andrea Eldridge last saw John Muszala II, he was in the front seat of a T-6 Texan, taking his checkride. At the 2011 Chino Air Show the young Muszala was expertly flying Jim Slattery’s gorgeous A-1E Skyraider. After nearly giving up his search for a rare tailhook SNJ, Chuck Wahl finally obtained an SNJ-5C project. What came out of his shop, Vultures Row Aviation, was a visual definition of authenticity. Take a leap back in time and put yourself inside the cockpit of Scott Glover’s C-47, Serial No. 42-32832, and join the 53rd Troop Carrier Squadron on Operations Husky and Market Garden. When John O’Connor purchased LSFM’s F8F-2 he knew the aircraft would need some TLC so he enlisted Ezell Aviation to help him wake the hibernating Bearcat. After years of dedicated work The Fighter Factory completed a beautiful restoration on an FM-2 Wildcat. Now part of the Military Aviation Museum, this Wildcat is based only a few miles from where it served in Pungo, Virginia. As a child Scott Glover told his dad that someday he wanted to go to Oshkosh in a C-47. In making that childhood dream come true he unknowingly purchased a plane with an extensive combat history. As David Elliott uncovered the history Scott undertook the daunting task of restoring the plane to honor its World War Two pilot, Lt. Don King. Continuing a tradition of excellence, the 2011 Chino Air Show commemorates the Centennial of Naval Aviation and puts an amazing collection of warbirds in the air. 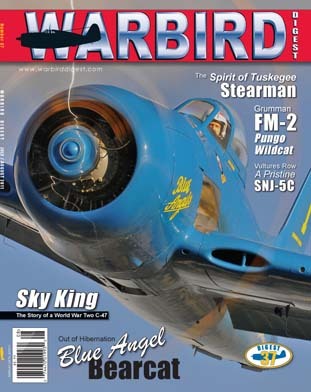 When Matt and Tina Quy took the leap into the purchase and restoration of a PT- 13D they learned their plane was assigned to Tuskegee, Alabama to train pilots of the 332nd Fighter Group. It has been an amazing journey, from the restoration to meeting Tuskegee Airmen, to winning honors at AirVenture. Waukegan, Illinios is home to one of the most active flying museums in the country. Founder Paul Wood has been successful in achieving the Foundation’s goal of restoring and operating historic military aircraft.